As the principal broker and co-founder of M Squared Real Estate, Mark Mlakar is responsible for the company's day to day operations overseeing the brokerage, management and consulting offerings. Under his leadership, M Squared is quickly becoming a powerful brand with a client list consisting of some of the finest properties, developers and individuals in the city. One of Washington's most innovative and respected agents, Mark is widely known in the real estate community as a broker's broker, with a keen understanding of the market and exceptional acumen for sales and negotiation. He also has the unique ability to work well with all parties involved: buyer, seller, landlord, developer or broker, and to identify with their needs. In the fall of 2010 Mark partnered with Dominic Morrcco, one of the top real estate technology experts in the nation to help co-found M Squared Real Estate's Residential Brokerage Business. Their idea was simple; take the technology, graphic design and marketing burden off its agents, execute it to the highest possible standard, and free up their time so they can focus on being the very best version of themselves: delivering value, offering quality insight and nurturing their client relationships. A talented tennis player born in Croatia, Mark came to the United States at the age of 10. 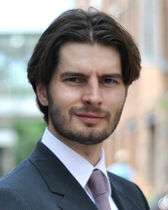 He graduated from Georgetown University and began his real estate career in 2001. He currently lives in Logan Circle and is highly passionate about volunteering with local animal rescues to foster abandoned dogs. Use the form below to send a message.